The Osage are a Native American tribe that once dominated much of the central United States including portions of Arkansas, Oklahoma, Kansas, and Missouri. Today, many Osage people live on the Osage reservation in northern Oklahoma. 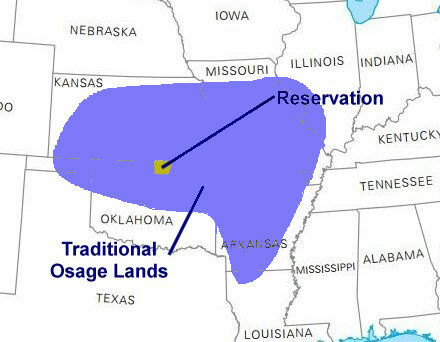 The Osage traditionally lived in the central United States. Throughout the 1700s and early 1800s they were the dominant power throughout much of Arkansas, Oklahoma, Kansas, and Missouri. In the late 1600s, the Osage established trade with the French. They mostly traded furs in exchange for horses. The Osage maintained a close relationship with the French for many years even after their land was purchased by the United States as part of the Louisiana Purchase. In the late 1800s, the Osage were forced from their land by the United States to make room for white settlers. They moved to a reservation in Oklahoma. What kind of homes did the Osage people live in? The Osage lived in dome-shaped homes called wigwams or wikiups. They would build a frame made of wooden poles and then cover it with animal hides or packed sod. When they ventured onto the Great Plains to follow the bison herds they lived in teepees which were easier to move. Most Osage today speak English, but there are a few people who still speak the traditional Osage language and are trying to keep it alive. The Osage language is a Siouan language similar to the language spoken by the Crow and the Sioux peoples. The Osage wore clothing made from deerskin. The women wore long dresses, leggings, and moccasins. The men wore breechcloths, leggings, and moccasins. During the winter they would keep warm with thick robes made from bison. The Osage hunted a variety of animals for food including bison, deer, and elk. They also farmed vegetables such as corn, beans, and squash. How did they get the name Osage? The name "Osage" comes from the early French traders. It was the French version of the Osage word "Wa-zha-zhe", which means "Children of the Middle Waters." Like many Native American tribes, the Osage didn't have a complex government. They lived in small bands and villages throughout the region. Each band would have two chiefs: a war chief and a peace chief. Today, the Osage reservation has a government with three branches including a judicial, executive, and legislative branch. The executive branch is led by a Chief and an Assistant Chief. Many of the Osage became wealthy when oil was discovered on their reservation in 1894. The famous ballerina Maria Tallchief is Osage. There are around 15,000 Osage people in the United States today. The first Europeans to meet the Osage were the French explorers Jacques Marquette and Louis Joliet in 1673. Several Osage visited Paris in 1725 and met with French King Louis XV.